While we still grieve over the losses of the weekend, we also move forward with sanctuary life. Today, Mona took another step forward in her rehab, moving from a small "Convalescence Paddock" into a small herd. Before coming to Traveller's Rest, Mona lived, for some time, in a small pen no bigger than an average stall. "Whooaa, Dude! What do I do now?!" We love old horses. No secret there. But because we focus on old horses, specifically, saying “goodbye” is an all too common occurrence. Sometimes the decision is difficult. There is no clear answer. Is the horse in pain? Can the pain be managed? Will he recover from the current malady, or will he continue to decline? Is he happy, or does he seem distressed? Do the “good days” outnumber the “bad days?” All questions that rarely have straightforward answers. At times, however, the right answer is clear. Saturday, was such a time. Oracle coliced. With no warning, for no apparent reason, our Tough Ol’ Broad went down in pain. The vet arrived as quickly as she could get here, began an exam and administered medications to ease the pain. Even with the meds on board, Ori’s pain continued. Doc gave her a poor prognosis. Non-surgical treatments were long shots. Surgery might save Ori’s life, but her age and other chronic illnesses made her a poor surgical candidate. There was only one answer. We had to let go of our desires and heartache and make a decision in Ori’s best interest. With a veterinary opinion that our tough little Welsh girl was likely not coming out of this one, we could not allow her to endure worsening pain that might continue for hours or days before she would succumb to shock. The light had already left her eyes which looked out with a blank stare. No time for prolonged goodbyes, treats, one last fling in the “Outback” field. The time was now. Then, with one final act, Oracle was gone. 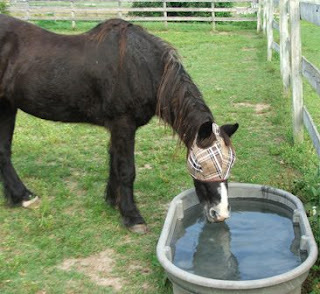 The pony who had no use for humans when she arrived at TREES left his life knowing that many, many people cared. Thank you to the SARA volunteers who stayed with her throughout the morning, until her last breath. Now. Monday. Now we can take time to sort out our own feelings. To try to figure out what happened. What did we miss? What could we have done differently? Why Ori? Why now, just as she was re-learning to like people? We will likely never have answers to any of those questions, or to the many questions that will continue to arise over the next few days. The one question we do have an answer for is “Did we do the right thing?” Yes, I believe we did. Was it hard? Absolutely. It’s difficult to hear and to accept the statement “There is nothing we can do.” To accept that verdict, we must let go of our own wishes. And so we did. But we haven’t let go of Oracle. Her presence will be felt for many years, as we continue to feel the presence of all former TREES residents as they guide us, push us and sometimes prop us up. They are the spirit of Traveller’s Rest. The reason TREES exists. And so, we grieve for now. 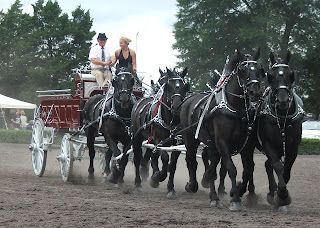 In time the grief will turn to celebration of the horses we’ve met and fallen in love with. 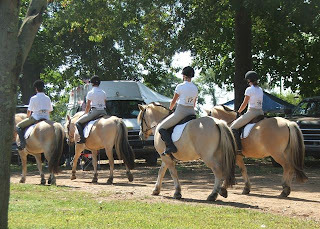 Watch 42 year old Sunny performing in a dressage schooling show. 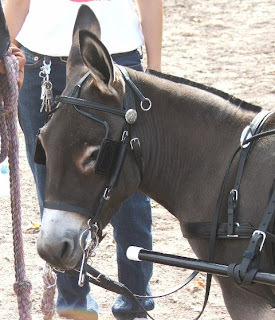 Kudos to Lavendar Hills Riding Academy for allowing this pony to keep teaching! As a short follow-up to the previous post on laminitis, we wanted to bring attention to a study performed by the UK's The Laminitis Consortium. 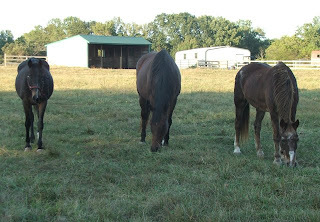 Many people believe that soaking hay removes water-soluble carbohydrates, making the hay safe to feed to laminitis-prone horses. This may not be the case. In addition, there is concern that soaking for a long time may remove so many other nutrients that deficiencies in protein, vitamins and minerals may result. 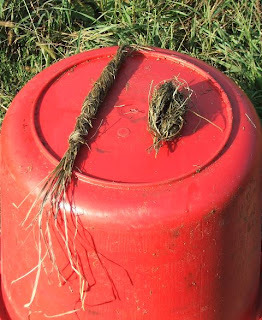 For more information, please read the Equine Science Update article, Laminitis: value of soaking hay? Read almost any horse-related magazine, forum, bulletin board or newsletter, and eventually, a discussion of laminitis will surface. “My horse has laminitis. What’s the best way to treat it? The first thing to realize is that laminitis is not a disease unto itself. Laminitis - meaning “inflammation of the laminae” - is a symptom of something else going on in the horse’s body. In other words, to control the laminitis, you must determine and treat the cause. Administering all the anti-inflammatory and vasodilating drugs on the planet will not help if the root cause is not addressed at the same time. 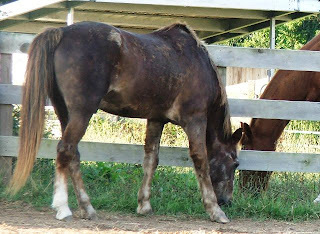 In TREES' case, the laminitic horses we care for all suffer metabolic disorders, some related to Cushings Disease, some not. In every case, though, all tend to have high insulin levels unless their diets are very carefully managed. In every case of active laminitis, the insulin levels were well above what is considered normal, sometimes as much as ten times the norm seen in unaffected horses. To manage those horses' insulin levels, we think of their management in the same way we think of caring for diabetic humans. Foods low in sugars and other simple carbohydrates, small frequent meals, maximum turnout (exercise - also beneficial in keeping arthritic joints moving, and guts functioning properly), and plenty of water. In the food category, no sweet feeds, no apples, carrots, or other starchy treats, no sugar cubes, no peppermints or other candies, no cookies, no applesauce, no corn syrup, no maple syrup, no ....well the list is endless. 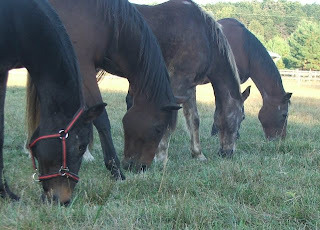 What IS allowed is a feed low in non-structural carbohydrates, soaked alfalfa cubes, and hay (remember, though, that all hays are not created equally and greatly vary in sugar content.) That's it! And, of course, the ultimate benefit of eliminating every source of sugar we reasonably can eliminate is an appreciable reduction in laminitic episodes in even those horses previously deemed "chronic." We do take a deep breath any time one of our "metabolic" horses takes one bad step but most often that bad step is not because of laminitis. 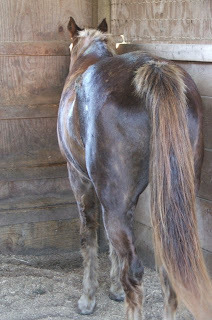 Should laminitis, however, rear its ugly head again, we'll re-evaluate, find the cause, and work to resolve the underlying issue as we also nip the inflammation in the bud. We don't post every senior that needs a home (if we did, that's all this blog would contain) but this one is a little disturbing. "This horse is free. I am moving to Kansas this weekend and have found out that I cannot get a hitch put on my truck (they are on back order and nobody has the type that I need). I cannot take her with me." We've heard a lot of endings to the sentence "I can't keep this old horse because......" but this is a new one. Visit the posting at http://baltimore.craigslist.org/grd/1386581481.html to contact the person who posted this. Free trail horse/broodmare. Date: 2009-09-22, 9:57AM16.2 hand sturdy chestnut TB mare. Blaze and socks, with some black in her tail. 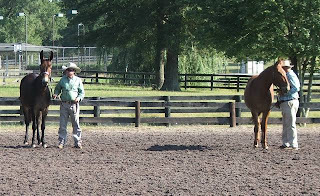 She has been used for beginning dressage, lessons, trails, lead line, and breeding. Kids can groom her, and can ride her on a lead line. For independent riding, she requires an intermediate rider who has good hands and legs, because she is sensitive to the aids. 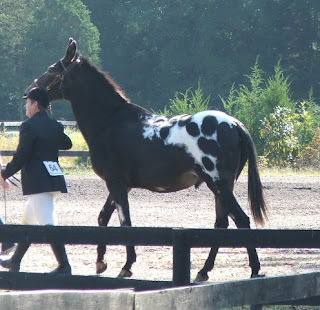 She has never spooked, reared, bucked, kicked, bitten, shied, etc in the ring or on the trail. She's a good girl, and likes to go (she'll go as fast as you allow), and slows down or stops when asked. She does prance, but she quits if you are consistent with her. She uses a loose ring snaffle bit and goes english (she doesn't neck rein). She loads, clips, cross ties, trailers, and is calm in the wash stall. The farriers and vets say she acts like a quarter horse...totally quiet during vetting and shoeing. She has NO VICES whatsoever, NO HEALTH ISSUES, and is a very easy keeper. 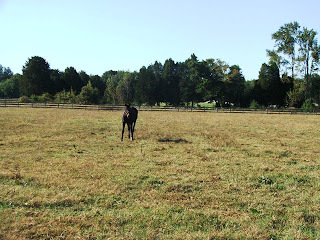 She is good in the pasture with other horses. She does have a small bump on her knee from an a very old injury, but it does not effect the way she moves under saddle. 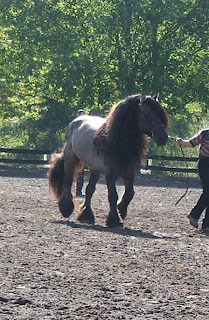 Her trot and canter are very smooth and easy to ride, which is unusual for her size. She loves to be groomed. She foaled a beautiful Hanoverian cross 3 years ago. She throws big, beautiful foals. 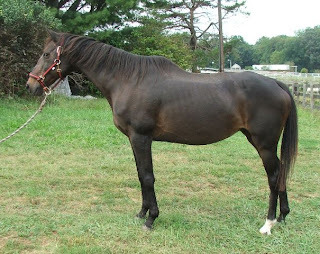 You can see this 3 year old beautiful 16.3 hand gelding at this farm. She is an easy breeder (bred without hormone treatment), and takes on the first try. She has not been ridden for a year, because we have been working with the foal. You could get on her and she would behave, because I've given her a year off before, and she was great the first time I got on her. Her back muscles need a little excersize before putting a saddle on her, though, so whoever takes her should lunge her for a few days to build up her back first. This horse is free. I am moving to Kansas this weekend and have found out that I cannot get a hitch put on my truck (they are on back order and nobody has the type that I need). I cannot take her with me. Please take her so that I don't have to sell her at the auction. 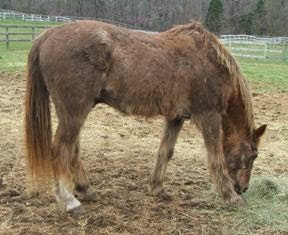 She is a better horse, even at 22 years of age, and does not deserve to be an auction horse. She has a good 8 years of riding left in her, as she has been very well cared for. 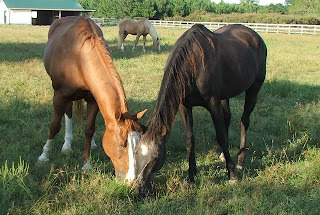 I am happy to announce the 2nd orientation class for the Shelter Animal Reiki Association (SARA) program to be held at Traveller's Rest Equine Elders Sanctuary (TREES) in Spotsylvania, VA on Saturday, Sept. 26th from 9am-11am. The orientation will be from 9am-10am. You must attend this orientation before participating in the SARA program. From 10am-11am we will meet the residents of TREES and be joined by other SARA/TREES practitioners as we offer healing sessions to the TREES residents. I hope that you will be able to join us. Traveller's Rest is a founding SARA shelter/rescue. Over the summer we have had a small group of SARA/TREES volunteers working with many of the animals offering Reiki both in-person and distant sessions. We would love for you to join the group. The more Animal Reiki volunteers we have the more successful the program will be and the animals will thrive. We already have lots of wonderful stories to share with you. To participate in the program you will need to attend a TREES/SARA orientation. 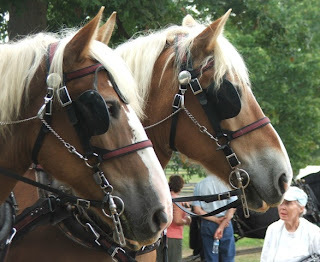 Then you will be able to volunteer at Traveller's Rest by offering Reiki sessions to the horses. Most of the residents of TREES have been participating in the Reiki level one and two courses for over one year and just love Reiki. ==the growing number of Reiki practitioners who wish to establish programs in their local shelters, sanctuaries and rescues. ==the animals and staff of those organizations. ==the people and animals of the community at large. ==create a harmonic energetic space within the shelter environment. ==promote stress relief and relaxation for the animals, as well as human caretakers. ==support healing possibilities on all levels (physical, mental, emotional and spiritual) as well as higher adoption rates. ==teach an ethical approach when working with Reiki and animals. ==document the effects of Reiki on individual animals as well as shelters as a whole. ==serve as a world-wide information and referral resource for Reiki practitioners, shelters, sanctuaries as well as other facilities that assist animals in need that wish to incorporate an Animal Reiki program. ==educate the public, shelters, sanctuaries and other animal facilities on the benefits that Reiki can provide for both animals in need and the humans that care for them. To me, one of the most important ideals of SARA is we teach people how to work with Reiki and animals in an ethical way and promote the highest standard of professional Shelter Reiki programs around the world. Please let me know if you will be attending so I can send you directions and further details. If you know of someone that might be interested in this program or interested in offering Reiki to the residents at TREES please forward this email to them. I hope to see you soon. What a weekend! We're tired, but so grateful to the VDHMA for allowing us to sneak into a vendor space on short notice. It must have been meant to be. Folks, if you have a chance to attend next year's show, I encourage you to go out and support this organization. From our vantage point this show was well-run and professional and everyone we met seemed to be not only passionate about horses, but also supportive of fellow exhibitors. All perfect ambassadors for the draft breeds and their talents. Thank you, as always, Gene and Carol, for two days of set-up, staffing, lunch and cleanup. Thank you, too, to everyone who stopped by and offered support and resources for everything from electrician services to sources of reasonably price hay to donations of used tack. And finally, thank you, Polly - your vendor coordination was flawless from our standpoint. If one more person calls me cute........what I lack in height, I make up in willingness and manners. 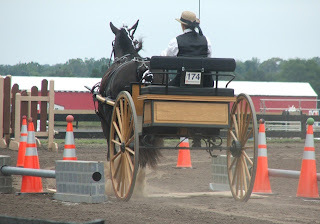 A shire mare navigating the obstacle course. Not too many Belgians in attendance, but here is a beautiful pair. And this was the "Feel The Thunder" moment. 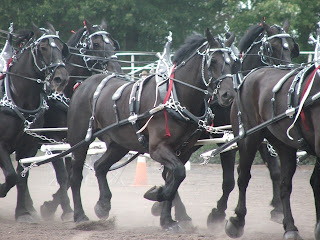 When these big horses trotted by, I could feel the drumbeat in my feet, right up through my teeth. It made my hair stand on end. 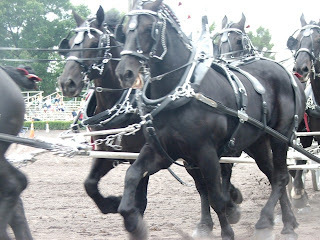 Today was the first day of the Virginia Draft Horse and Mule Association's 2009 show. What a perfect day. The weather was ideal and the organizers, exhibitors and vendors were the friendliest bunch of people anyone could ever hope to meet. Many stopped by TREES' booth to chat about the elder equine, past and present, and pick up a Golden Horseshoe for luck. We'd like to thank everyone involved in this incredible weekend. Can't wait for tomorrow. Meanwhile, here are just a few photos from today. 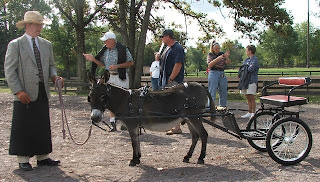 The mule classes were very popular. Seemed like they attracted a bigger crowd than the draft horses for much of the day. 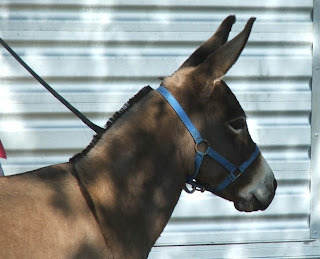 This rare fellow, if we understood the Virginia-ized pronunciation of the name, is a Poitevin. Do Fjords always travel in packs? Sunday should be a lot of fun, with the driving classes, log skidding, and more "work related" competitions. Hope to see you there! Thank you to all who stopped to visit and dropped a little change in the jar. The Elders thank you , too. When we moved to this farm in 2002, the barn was crawling with mice. As we cleaned out piles of old hay and bedding, we found a cluster of snake egg shells in the old sawdust.. Hm. Interesting. 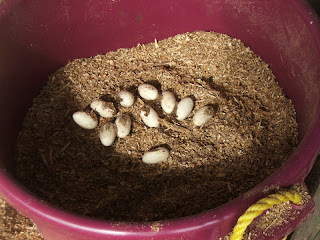 The eggs, we learned the next year, belonged to a black rat snake. Mama rat snake has blessd us with a cluster of 13-17 eggs every year since. Except for the year 2003, when we had fewer horses and were using bagged shavings, she has always placed them safely in the sawdust pile. Knowing the bedding supply is mama's preferred nursery, we try to watch for the eggs beginning in mid-summer. 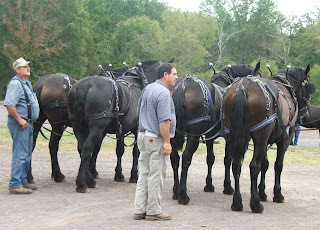 When they appear, they are moved to a man-made nursery which, basically, is a 70-quart manure bucket filled with the same sawdust in which they were laid. Tucked safely away in the bucket, there is less danger of having the eggs scooped up and dumped in a stall. 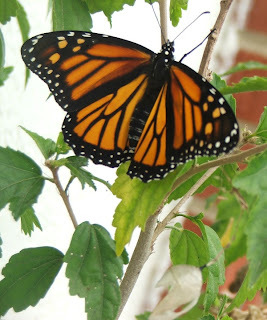 This week we were blessed not only with Monarch butterflies, but with a whole new generation of mousers as well. We get a lot of calls and emails asking if TREES needs barn cats. Sorry kitties, but the jobs are filled. 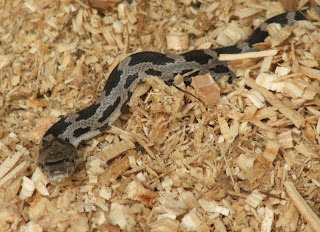 These snakes made our earlier mouse problem a thing of the past in no time. Thanks, Mum! Who says Spring is the time of Birth and Renewal? 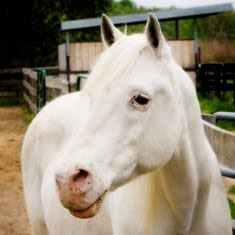 "Horse owners faced with the decision to find their horses a new home, whether it be locating that perfect retirement home, a new job in therapeutic riding, the mounted patrol, or even with a new owner, need to ask some important questions before giving up care of their animal." 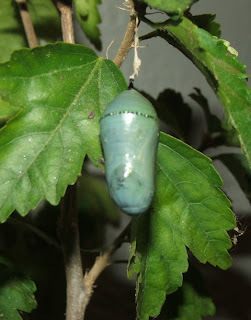 I don't know where this chrysalis started out, but I found it on the ground as I was getting ready to reposition a newly scrubbed 50-gallon water tank. 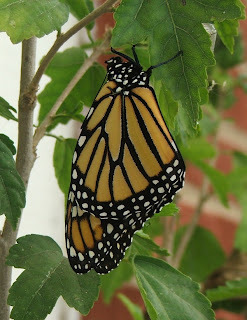 I'm sure that's not where it wanted to be as the Monarch Butterfly inside prepares to emerge. For the time being, its nestled in a small shrub next to the house. 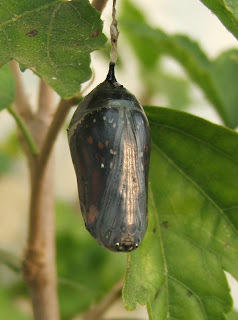 See here to view all the Monarch's stages of development, from egg to adult. And a sidenote to all who find our less than perfectly manicured farm distressing.........this is why we always leave some milkweeds! 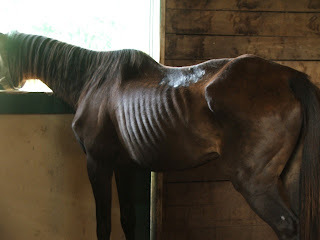 During the past few weeks, there has been some discussion on several Internet forums about how a specific medical crisis was handled at another horse welfare organization. We're not going to discuss the details or opine on who was "right" or "wrong" but, eventually, the discussion turned to criticism of the farm's appeal for donation of bandaging materials. "If they can't afford bandages, how can they afford feed, hay, vet care, etc etc etc?" Not many people are able to donate, say, $1,000 for a load of hay. But most people that want to help can manage a bottle of fly spray, several rolls of vetrap, or a few tubes of antibiotic ointment. Now, if only 100 people donate one $10 item, that's $1,000 not coming out of TREES checking account for "little stuff." $1,000 that can then be spent on hay, vet bills, senior feed, etc etc etc. Coming from another angle, we never want visitors to feel their gifts are "too small" or "not much." Every - and I mean every - donation contributes to the overall well-being and happiness of TREES' resident geezers. That includes donation of "stuff," time, services and good old moral support. Celebrate the "little things." We do! We'll be there! How 'bout you? In a way, this brings TREES "full circle." 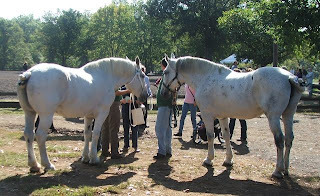 It was at Draft Horse and Mule show in 1995 that TREES' founders first discovered the Equine Rescue League and learned about equine welfare issues in Virginia. Almost 15 years later, we hope someone else will be motivated, by our information to booth, to get involved as well. 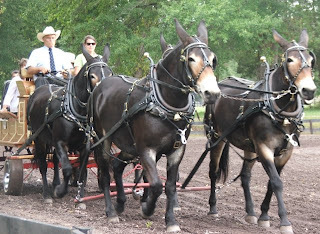 Halter classes - see draft horses of all breeds, as well as donkeys and mules! And that's just PART of the first day! Oh, and stop by the TREES booth to say Hi! 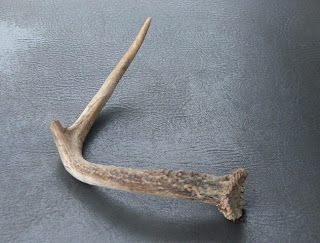 Found this near Freddie's "feeding station" at supper. We've suspected for years that Freddie is a unicorn in disguise. The horn is curly because of his Cushings, of course. 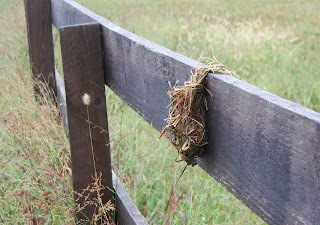 Is this the horsey equivalent of sticking your gum under the table at the cafeteria? If I had to guess, I'd say this is Emma's. She is constantly carrying her quids around, twirling them, waggling them, savoring the last bit of juice, then parking them somewhere when she comes upon something that looks more tasty. Mona received some very special guests Sunday. A lady named Joanie stopped by specifically to visit with Miss Mona. So, what made this particular visit so special? Well, Joanie and her husband, quite literally, saved Mona's life. It was this couple who discovered Mona and her herdmates in the dire circumstances that had already cost 20 horses their lives and immediately called for help. Their quick action saved quite a few lives, both equine and canine. This story is proof that one person, (or two people,) can absolutely make a difference in the world. Just by filling a few water buckets. By making one phone call. By following ideals with action. Don't ever sit back and watch tragedy unfold because you feel that you, as an individual, can't help "enough." Sometimes its "enough" just to start the ball rolling. Remember Wade's Valentine's Day breakfast with Marye? Wade is 26 year's old, Marye is 29. Who says love is only for the young? Josh arrived in April 2009, looking a little like a Lesser Virginia Yak. When I first saw a picture of him, I forwarded it to our vet with the note "I'm thinking Cushings." Her reply was something like "Yikes! I think your right." When we ask our vet to evaluate or monitor a horse who has, or who is suspected of having, Cushings (more technically called Pituitary Pars Intermedia Dysfunction or PPID,) she takes a blood sample to measure the level of Adrenocorticotropic Hormone or "ACTH." Since ACTH levels naturally vary with time of year (its one hormone that increases as hours of daylight grow shorter, signally the body to prepare for winter,) we usually wait until late spring or very early summer to test. In early June, we had a ACTH test festival, testing nine horses - 5 previously diagnosed were tested to see if their pergolide dosages were adequate, and 4 suspects. 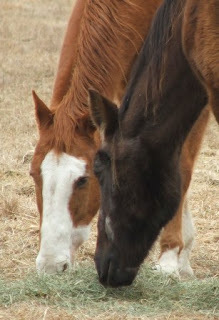 Two of the four suspicious looking horses were just grazing the upper end of the normal ACTH range. They will continue to be monitored and will be tested again next year. The other two of those four, however, Sonny and Josh, were added to the Cushings roster. As a matter of fact, Josh's numbers were not only high, they were "off the charts." We were not surprised. He did shed his yak coat in the spring, but it was immediately replaced by another winter coat. In May! Josh was started on pergolide and within a couple of weeks, began to shed. He doesn't yet have a "normal" summer coat, but what a difference! How's that for a 38 year old derierre?